Father’s Day is always a special day for the dads in your life, but how about new dads? Dad’s Day is especially special for them, and you want your gift to reflect that. My husband and I are new parents, so for this article (and secretly to help me pick out a gift), I asked hubs to weigh in on awesome Father’s Day presents for new dads. From next-level framed photos to the perfect fitting Levi’s®, here are nine Father’s Day gifts for every kind of new dad in your life. This gift is for the new papa who frequents Instagram, Facebook or Snapchat posting cute pics of his li’l one. Grab your favorite snaps, and create an Instagram photo book. Artifact Uprising offers the most beautiful square-shaped photo books. With a GoPro, the new dad in your life will have so much fun documenting adventures with his li’l one. The Hero4 Session is the smallest, lightest and most convenient of the GoPro cameras — features a busy new dad might appreciate. Get the new dad out of those dad jeans and into some stylish trousers. These Levi’s® 505™ jeans, available at JCPenney, are a happy medium between the skinny jean and its loose-fitting counterpart. I like this gift idea because it’s something you know the new dad will actually use — I don’t know many peeps who don’t wear jeans. With the Father’s Day sale price of $36.99, it’s a total win. When all else fails and the pocketbook is empty, you can’t go wrong with a handwritten card. Punkpost allows you to send one as quickly as you can send a text. With the app, you choose your card and what you want to say, and they will write it and drop it off at the post office for you. Pretty sweet, huh?! Going to the gym doesn’t happen most days for new fathers. Rather, finding ways to exercise with the baby is often more feasible. My newbie-dad husband loves to hike with our son. This Kelty Pathfinder 3.0 Kid Carrier makes hiking with a little one safe and comfortable. My husband, whom I call the Mountain Man, has one for our li’l man and loves it. 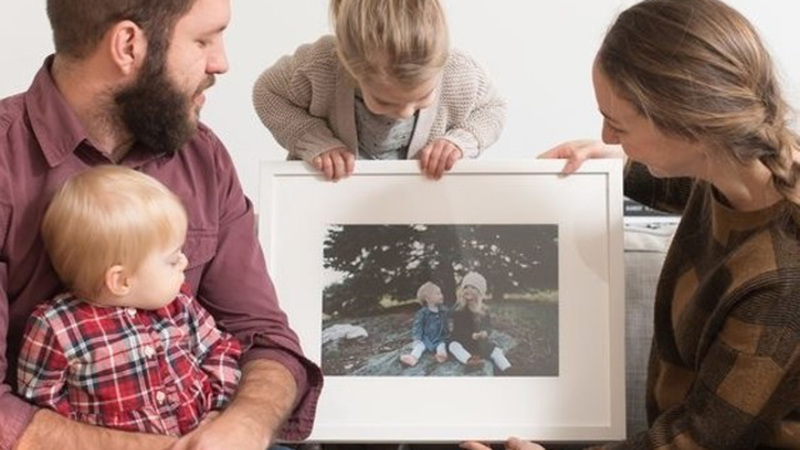 Rather than the typical 4×6 photo, give Dad a next-level framed photo of the new babe and him. Framebridge is my go-to for custom framing, because they make it so easy. Choose your frame, upload your photo or artwork, and receive it in the mail. I used it for some frames in our nursery, and the quality is amazing. For the techie papa who googles everything, the Amazon Echo is just the thing. The busy new father in your life won’t even need to get his computer out to get the answers he wants. Instead, he can just station the Amazon Echo in the kitchen and ask Alexa whatever his Googling heart desires. The inundated new father might appreciate this supersleek bottle opener by Fort Standard. Its unique shape is matched only by its important function. Not only do first-time mamas put themselves last, new papas often prioritize everyone over themselves. Sometimes they just need to put some headphones on and take time out for themselves. Beats by Dre should help. This post is part of a sponsored collaboration between Levi’s® and SheKnows.